Less than an hour and a half from central London. We have been invited by the Yale Center for British Art to attend a very special curator-led tour at Waddesdon Manor Buckinghamshire. This visit will mark the beginning of the Fall Season for the YCL Art Circle, and it will be wonderful to see many of you there for this great opportunity to view Fame and Friendship, a collaborative project between the Yale Center for British Art and the Rothschild Foundation at Waddesdon. We will be shown through the exhibition Juliet Carey, Waddesdon Curator of Paintings, Drawings and Sculpture. As we will probably be split into two groups we will also have the opportunity to explore ‘Royal Spectacle: Ceremonial and Festivities at the French Court’, another exhibition currently at Waddesdon Manor. After that we will be having lunch at the Manor Restaurant and we will then have the opportunity either to return to the house independently (timed entry), visit the Roman Mosaics uncovered at Lod, Israel, which are displayed in the Coach House, or explore the gardens. About the Exhibition, Fame and Friendship: This exhibition was organised by the Yale British Art Center and Waddesdon Manor and is curated by Malcolm Baker (University of California, Riverside). First shown at the Yale British Art Center, New Haven (20 February – 19 May 2014), it is now on view at Waddesdon Manor until 26th October. 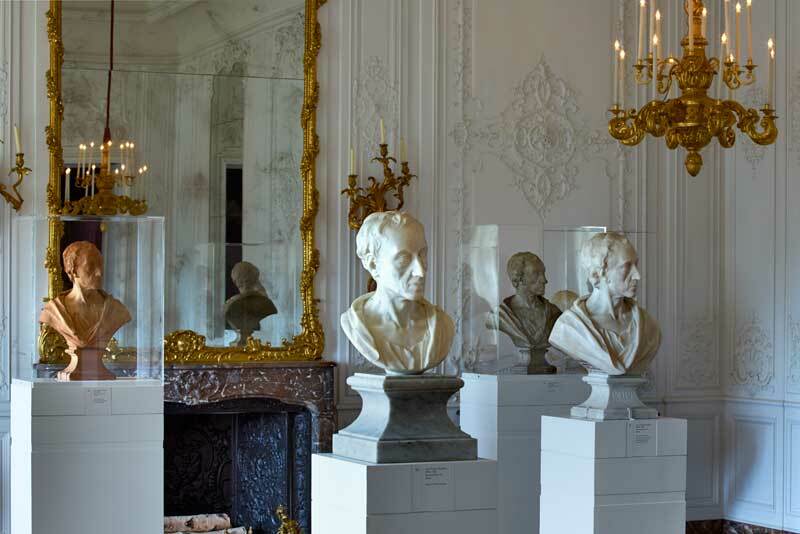 The full title of the exhibition being ‘Fame and Friendship: Pope, Roubiliac, and the Portrait Bust in Eighteenth-Century Britain’, it is centred on a series of busts of Alexander Pope by the French sculptor Louis François Roubiliac, who lived and worked in Britain. The idea for this exhibition was born from a desire to bring together the two busts owned respectively by the Yale British Art Center and Waddesdon Manor. As this idea grew into a full-blown exhibition, collectors and institutions from around the world agreed to lend their own versions of Pope’s portrait bust. These include signed originals as well as adaptations and copies from the period. Most likely intended for Pope’s closest friends, the busts are accompanied by other busts of Pope’s contemporaries as well as painted portraits of the poet by Sir Godfrey Kneller, Jonathan Richardson the Elder and Jean-Baptiste van Loo. The exhibition explores the idea of the author as an independent figure in 18th Century Britain, as well as the role and importance of replication in 18th Century sculpture. About the House: A celebrated and well-known Rothschild house, Waddesdon Manor was built by Baron Ferdinand de Rothschild between 1877 and 1883, designed by the French architect Gabriel-Hippolyte Destailleur. The Manor was then inherited by Ferdinand’s sister, Alice, who in turn bequeathed it to her nephew James de Rothschild in 1922. After WW II, James made the decision to leave the Manor, its collections, gardens and grounds to the National Trust. The ground floor of the house was first opened to the public in 1959 under the management of James’s wife, Dorothy, who then embarked on an ambitious restoration project of the house in 1984. The restoration programme was greatly expanded when Lord Rothschild took over the management of Waddesdon after her death in 1988. In addition to the extensive interior and exterior restorations and upgrades of the house and garden which took place in the 1990s, the Aviary was restored and Coach House and Stables were converted into a gallery for temporary exhibitions more recently. One of the largest endowments, Waddesdon Manor remains one of the most magnificent National Trust houses and the Rothschild family’s personal involvement in its management has kept its strong character and history alive. How to get there: Meeting point to be confirmed closer to the date. Our group will meet at Waddesdon Manor for a 10.00 am tour. PLEASE BE ON TIME, as we will not wait for latecomers. Do keep in mind that it takes some time to enter the Estate, the park and then take a coach to the meeting point. This is important as we will be shown in before the house opens to the public.